Curtis Tarver and Quintin Cole, two home brewers once affiliated with CHAOS Brew Club, decided to start a Chicago brewery after a series of successful beer making stints involving football. In December 2012 they began brewing beer for a February 2013 Superbowl party. The duo made seven styles of beer hoping to one of them would appeal to a varied audience. When most of brews were hits they decided to try and make a go of starting their own brewery. The pair always had a vision of opening something south of Madison Street. They found a property in the South Loop and when Curtis came up with the name of Vice District — an homage to the neighborhood’s scandalous past — they began their plan. Curtis and Quintin has one main goal for their taproom: create a communal space that is welcoming and fosters conversation. They succeeded. An open door policy is also in place for your favorite canine pal. Pop into the taproom and throw back a pint of Pleasure Trip, a popular blonde ale. Or try The Everleigh, an Extra Special Bitter named after the infamous Everleigh sisters who ran the Levee’s most famous brothel. No matter your choice, you can guarantee that you’ll be drinking in some history that tastes sinfully delicious. 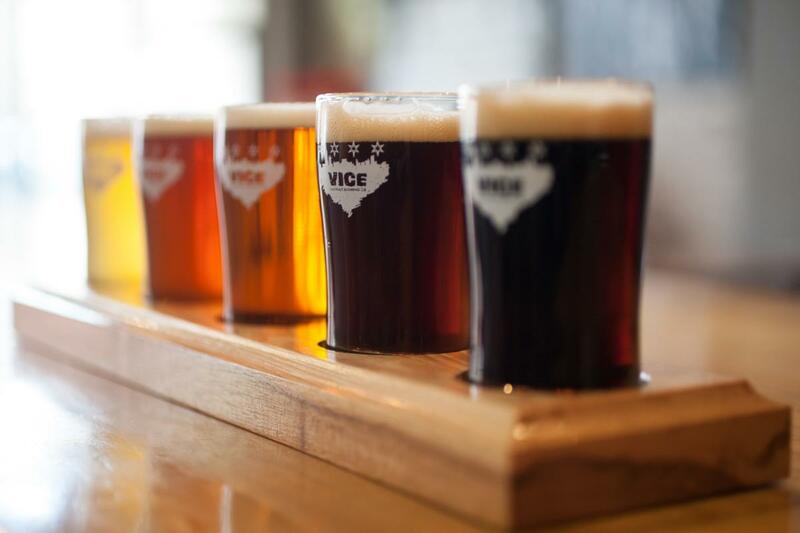 Check out Vice District Brewing when Friday Night Flights takes over the South Loop on July 21, 2017. The next installment of this summer-long beer series will also feature Motor Row Brewing, Baderbrau, Rock Bottom Brewery, Eataly&apos;s Birreria, and Gino&apos;s East. Festival tasting tickets are only $15 and are on sale online now! Beer curious...? Learn more about Chicago breweries and the city&apos;s neighborhood beer trails at choosechicago.com/craftbeer.